“AVENTAGE represents the ultimate in home theater, and now with Surround:AI, our new artificial intelligence sound processing built into these flagship AV separates, Yamaha stands alone at the pinnacle of ultra-high-performance components,” said Robert Goedken, Yamaha. Yamaha is harnessing the power of Surround:AI artificial intelligence and the most advanced audio technologies in its third-generation AVENTAGE-series CX-A5200 AV preamplifier, establishing new benchmarks in performance and innovation for entertainment enthusiasts and custom integrator professionals who expect the ultimate home-theater experience. Combined with the new 11-channel AVENTAGE MX-A5200 amplifier, the flagship 11.2-channel CX-A5200 delivers absolute audio realism with massive audio power, creating an expansive, full-bodied sound field capable of reproducing the subtlest details in immersive high-definition 3D soundtracks. With a no-compromise design and custom-installation capabilities – including integration with leading home-control platforms, balanced XLR connectors, and professional-grade digital-to-analog converters (DACs) – the AVENTAGE duo forms a solid foundation for high-performance and luxury home theater systems. 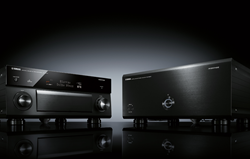 With Yamaha Surround:AI in the CX-A5200, surround sound gets intelligent via DSP technology. The AV preamplifier, in real time, automatically optimizes surround-sound performance for each scene in a movie or any piece of content. Surround:AI analyzes a scene’s audio characteristics, focusing on soundtrack elements such as dynamic range, amount of dialog, the degree of sound effects, background music, and channel balance. Surround:AI then compares the scene’s audio characteristics to a reference database of movie scenes and automatically processes the scene’s sound to optimize performance. Surround:AI makes dialog more intelligible in scenes with lots of background noise, delivers massive, full-bodied sound for scenes with immersive sound effects, and ensures that you hear softly spoken dialog and soft background sounds. Scenes with big musical scores deliver the best possible musical experience. To deliver high-performance surround sound, the CX-A5200 features a variety of advances, including immersive 3D Dolby Atmos® and DTS:X™ surround sound decoding with up to 7.2.4-channel processing. With Dolby Atmos and DTS:X, the CX-A5200 reproduces two to four height channels, enabling individual sounds to move precisely and seamlessly in the room in a 3D plane to produce the sensation of objects moving above your head. To further heighten the sense of realism, Yamaha improved its Cinema DSP HD3 signal-processing algorithms to enhance the sound field’s vertical dimension. A large redesigned power transformer delivers deep and powerful sound, and sturdy construction suppresses vibrations that degrade clarity and definition. Yamaha Parametric room Acoustic Optimizer (YPAO™) uses precision 64-bit EQ calculations to analyze and compensate for a room’s acoustic imperfections, delivering perfectly balanced sound. YPAO – R.S.C. (Reflected Sound Control) reduces the adverse impact of early sound reflections – sound reflected off the furniture and walls near a speaker – that can “muddy” up audio clarity and reduce the ability to convey the precise spatial locations of sounds in 3D sound tracks. Other significant performance-enhancing features include two ESS SABRE PRO Premier DACs (ES9026 PRO), delivering state-of-the-art 32-bit performance and an exceptional signal-to-noise ratio for superb clarity and detail. On top of that, balanced XLR preamp-level inputs and outputs – the same type used in professional audio applications – resist electrical and electromagnetic noise, keeping the sound pure and supporting the installation of long cables that would otherwise create noise problems. Balanced XLR connections are available to connect the CX-A5200 to the MX-A5200 amplifier and to connect the CX-A5200 to source components such as high-end SACD and CD players. CX-A5200 features of particular interest to AV integrators include three HDMI® outputs: two for no-holds-barred home theater rooms equipped with a flat-screen TV for daytime viewing and a video projector for nighttime viewing. The third distributes 4K video and audio to a TV in another room. The preamplifier integrates with installed home-control systems from Control4®, ELAN Home Systems, RTI, and others. To AV integrators looking to diagnose issues, the CX-A5200 can be monitored remotely using the Domotz and Ihiji solutions. The preamplifier’s lengthy roster of capabilities also includes seven 4K Ultra HD HDMI inputs with HDCP 2.2 copy protection. Through its HDMI inputs and outputs, the CX-A5200 passes BT.2020 wide color gamut (WCG) video in three high dynamic range (HDR) formats − HDR 10, Dolby Vision and Hybrid Log-Gamma formats − from 4K sources to compatible TVs. The TVs will thus be able to display a more extensive, realistic palette of colors, offering exceptional brightness and contrast, to reveal details previously not visible in the darkest and lightest portions of a scene. Built on the Yamaha-exclusive MusicCast wireless-multiroom platform, which the CX-A5200 also supports. MusicCast lets you stream your favorite music to MusicCast-enabled products throughout the house from thousands of internet radio stations, popular streaming services, networked music libraries, and externally connected sources − all controlled from the Yamaha MusicCast app. Supported streaming services include Pandora®, Spotify, SiriusXM Internet Radio, TIDAL, Deezer, Napster and more. Other key features include Wi-Fi, Bluetooth®, Apple AirPlay®, Spotify Connect and voice control of commonly used functions via Amazon Alexa-equipped devices. To bring the advantages of CX-A5200 processing to your ears, Yamaha introduced the MX-A5200 11-channel amplifier, which delivers a powerful 150 watts per channel (8 ohms, 20Hz – 20kHz, 0.06% THD, 2 channels driven), harnesses the best in amplifier design, and uses the highest quality components. A large high-output toroidal transformer and two specially developed high-capacity block capacitors provide massive power with generous headroom. A specially designed chassis with rigid-frame construction and double bottom eliminates the transmission of sound-degrading vibrations from the amplifier’s large power-supply transformer and other components. A symmetrical power amplifier layout, with left and right sides physically and electrically isolated, achieves optimal channel separation and allows for a significant boost in signal-to-noise ratio to deliver the highest quality output and an expansive sound stage. The MX-A5200 is as flexible as it is powerful. AV integrators can dedicate some channels to driving a home theater system while assigning other channels to distribute music to in-wall and in-ceiling speakers in different rooms. A Bridge Tied Load (BTL) option boosts output to the front-left and front-right channels to enhance fidelity and volume. Likewise, the amplifier can be configured to bi-amplify up to five speakers to improve sonic accuracy and bass response.